The rare 1991 vintage from selected casks is finally out. The old-fashioned hand grenade-shaped bottle boasts a unique label with specific handwritten tasting notes from that cask. Master Distiller John Ramsay determined that Glenrothes 1991 expresses berry fruit, vanilla and butterscotch, but we're not talking ice cream here! It's more like gunpowder. The listed flavours are subjective and will evolve according to the surroundings, food and mood you're in, but there is no doubt that the folks over at the Speyside distillery have packed an elegant beverage with depth and balance in this detonating bottle. "The typical characteristics of The Glenrothes are all here, of course, but the emphasis is on vanilla and butterscotch flavours, stated Alexis Pagis, Brand Manager of The Glenrothes. 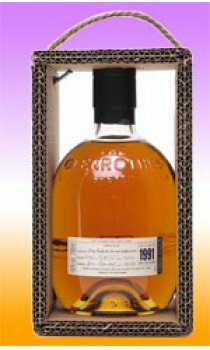 "Like each of The Glenrothes' Vintages that have come before it, the 1991 is unique, providing those fortunate enough to enjoy its richness with a new and exciting Single Malt experience of unmatched excellence."